Eager novice birders and novice purple martin enthusiasts often misidentify birds other common backyard birds to be purple martins. By learning a few helpful hints, behavior and range, you will be able to more accurately identify a purple martin from other birds such as the European Starling, other swallows such as the Tree Swallow and Barn Swallows. 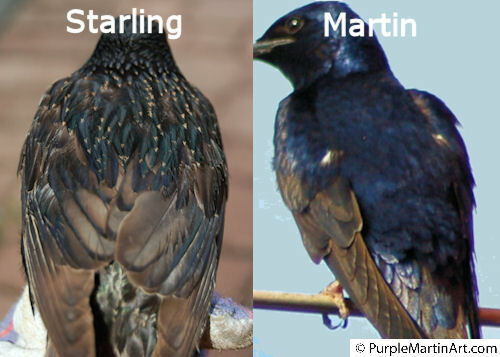 To the untrained eye the starling has a lot of similarities to the purple martin but by learning a few key points and comparing some glaring differences, you can quickly point out the purple martin. 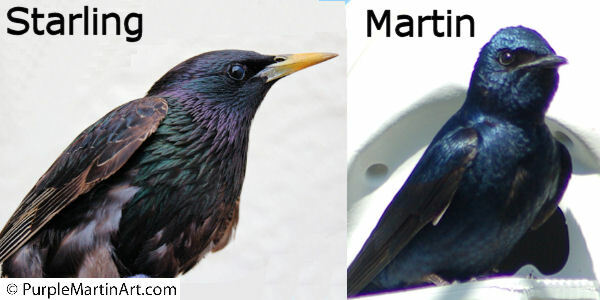 Though both darkly colored there are several glaring differences in the commonly misidentified invasive European Starling and the native Purple Martin. Notice the difference in color of the starling and purple martin. 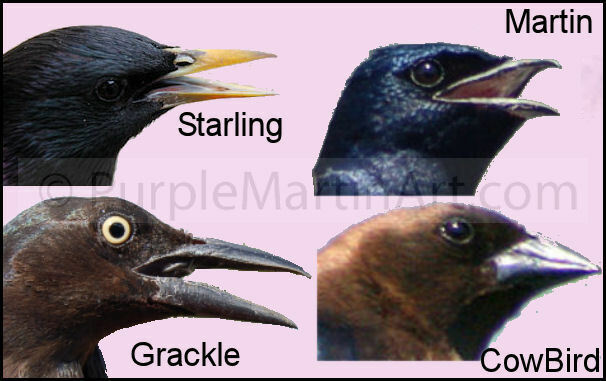 The European Starling males and females are darkly colored ALL over. They will have iridescence hues of green and purple on closer examination. A Starlings call sounds like a whistle that slides up and down. 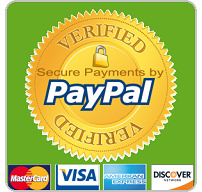 The tail is short and square. Where in a flock of blackish colored birds, only adult male purple martins will be uniformly colored a blue-ish blackish color. Female purple martins and the younger males will all have a lighter creamy colored or grayish chest. Purple martins song is a varied series of gurgles, clicks and song. The tail is slightly forked. Starting at the head, the beak is the main difference. and is deadly when matched against the purple martin. It's beak is a bright yellow color in both males and females. and much shorter with a downward curve. as it is designed to catch insects while flying. The starling will have flecks of coloring on its back. These flecks can appear iridescent or sometimes brownish in color. Purple Martins Never have any color variation on their backs. The wings of purple martins are longer and tapered. The eggs are larger as well. feathers and bits of paper etc. Purple Martin eggs are white. Nest are usually lined with leaves. The eggs just slightly smaller. In nestlings there are several differences that are apparent at an early age. 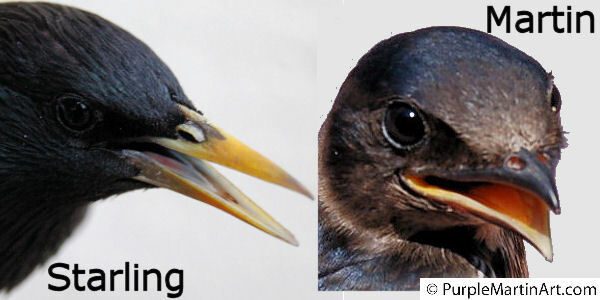 Starling nestlings have sparse down and a brightly colored yellow beak. The legs are longer as well. Purple Martin nestlings do not have down and are naked until feathers begin to grow. the growing feathers look like pins or quills until they begin to unfurl. and do NOT have a downy or fluffy appearance at any time. Notice on these two nestlings that are similar in age. The Starling still has fluffy areas of down on its head. has the much more pointy, longer beak that is a bright yellow on the sides. The Martin has no down. Purple Martins never over winter in North America. Before the first day of Autumn purple martins are no longer in our area. So if you see swooping swallow type birds they are probably Tree Swallows or Barn Swallows that do winter in southern parts of the USA. Purple Martins do not regularly forage for food on the ground and do not eat seed out of a feeder. Purple martins can be trained to accept supplemental feedings of meal worms, crickets or egg shells off a platform feeder however they are not eating seeds or suet at feeders. Purple Martins usually forage for insects fairly high in the sky in lose knit groups. Barn swallows are often misidentified as martins, feed much lower to the ground. Purple Martins will have completely dark adult males and females and younger males with lighter underparts in their flocks. Purple Martins will not visit your bird bath for a bath or to drink. Purple Martins are native songbirds and are protected by state and federal law. Starlings are year round residents, are not native and are not protected (in most states) by law. Starlings will feed off the ground, eat seed or suet from a feeder and use bird baths regularly. Starlings will kill native cavity nesting birds. Starlings do not fly about in the sky feeding but in the winter they can form huge flocks of hundreds or thousands of birds that flock in unison fairly low to the ground. Tree and Barn Swallows remain to some extent in North America during the fall and winter months. Tree and Barn Swallows will forage and feed in lose knit groups fairly low to the ground. Tree and Barn Swallows will sometimes make a chattering sound as they fly about feeding or they can be silent. Tree and Barn Swallows, both male and females of all ages, will have lighter colored underparts. Tree and Barn Swallows are native songbirds and are protected by state and federal law. Tree Swallows have snowy white underparts, shorter beak and more forked tail than the purple martin. The Truth is in the Beak! Most times, one can determine if a bird is or is not a purple martin by looking closely at the beak. Size, length, shape and color are dead give always to birds that are often mistaken for martins like European Starlings and Grackles. 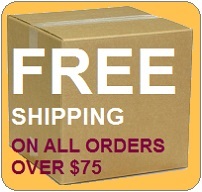 Everything that you need for your purple martins is available right here.